Rene Theophile Hyacinthe Laennec (1781-1826) is best known for his invention of the stethoscope, one of medicine's most powerful symbols. Histories, novels, and films have cloaked his life in hagiography and legend. 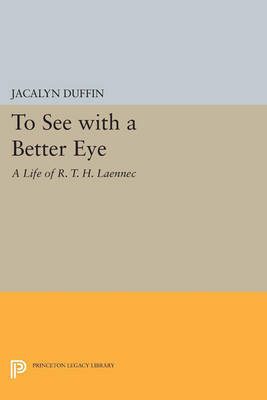 Jacalyn Duffin's fascinating new biography relies on a vastly expanded foundation of primary source material, including thousands of pages of handwritten patient records, lecture notes, unpublished essays, and letters. She situates Laennec, the scientist and teacher, within the broader social and intellectual currents of post-Revolutionary France. Her work uncovers a complex character who participated actively in the dramatic changes of his time. Laennec's famous Treatise on Mediate Auscultation was his only published book, but two lesser known works were left in manuscript: an early treatise on pathological anatomy and a later set of lectures on disease. The three parts of Duffin's biography correspond to these books. First, she examines Laennec's student research on the emerging science of pathological anatomy, the background for his major achievement. Second, she uses his clinical records to trace the discovery and development of "mediate auscultation" (listening through an instrument, or mediator, to sounds within the human body). The stethoscope allowed clinicians to "see" the organic alterations inside their living patients' bodies. Finally, she explores the impact of auscultation on diagnostic practice and on concepts of disease. Analyzed here for the first time in their entirety, Laennec's College de France lectures reveal his criticism of over-enthusiastic extrapolations of his own method at the expense of the patient's story. Originally published in 1998. The Princeton Legacy Library uses the latest print-on-demand technology to again make available previously out-of-print books from the distinguished backlist of Princeton University Press. These editions preserve the original texts of these important books while presenting them in durable paperback and hardcover editions. The goal of the Princeton Legacy Library is to vastly increase access to the rich scholarly heritage found in the thousands of books published by Princeton University Press since its founding in 1905.